At nursery we have 3 monthly parents evenings and an eyfs review, as part of the review we are given areas which T needs to start learning, in which both nursery and parents work together to achieve before the next review. In all honesty most of these 'next steps' are achieved well before the next review, the hubs and I work really closely with Ts key person to achieve them, I think because we take an active interest in T's progression nursery staff are happy to follow it through their end too rather than just go through the motions. One of the next steps for this review was sizes, so we have been working on size games at home. 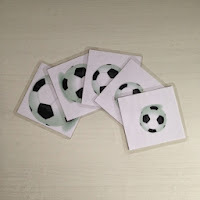 Keeping topical with the football theme and trying to find something that would keep T's attention for more than 3 minutes, I created some different sized football cards. The photo below shows 5 because we've misplaced one but there are actually 6! I also tried giving T all the cards and asking him to put them in order - let's just say that he didn't quite grasp that one and we are still practising ;) by this point his mind wandered! As with all of my printables and activities, there's no skill or design involved so don't expect factory quality, just a simple PDF file designed to be uncomplicated so that you can create the activity in minutes! I have laminated mine but you don't have to. 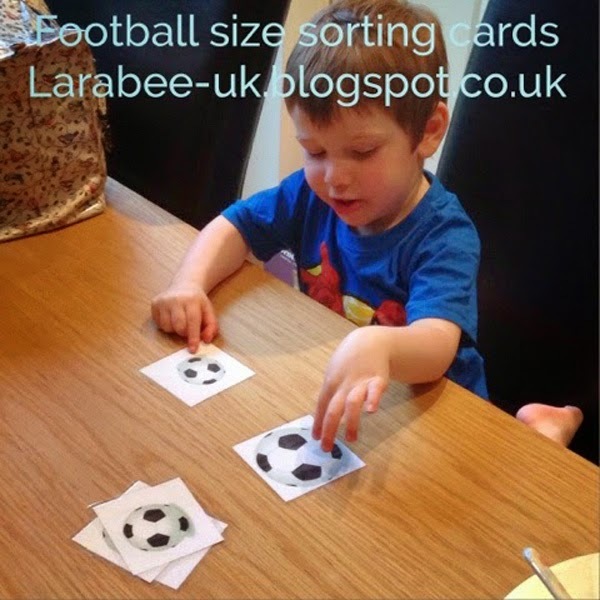 To further the learning on this one, we'll perceviere on the size sorting and I plan to eventually use them with playdough and get T to create a similar sized playdough ball and match them up (hence I laminated them!) 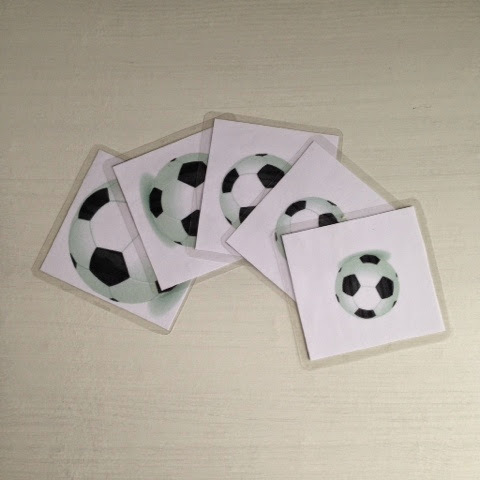 I'm also trying to find 6 respectively sized 'balls' so we can match those up to the right sized card, although that might just turn into 4 different sized pom-poms and 4 cards. Have a look at our Football and World Cup Theme Pinterest Board for more ideas.